During this past week, the first observation of stripe rust was made in Oklahoma in southern/southwestern Oklahoma in Jackson County where Gary Strickland (Extn Educator; Jackson County in SW OK) and Mike Schulz (Altus Station Superintendent) found a low incidence of this rust on wheat (Figure 1) in a variety demo and in a producer’s field. Leaf rust also was observed at a low incidence as was leaf spotting due to Septoria/Stagonospora. David Nowlin (Extn. Educator; Caddo County in central Oklahoma) also continued to observe leaf spotting. In scouting variety demos in Washita and Kiowa Counties, Heath Sanders (SW Area Extn Agron Speclst) did not find any powdery mildew, leaf rust or stripe rust. Around Stillwater, not much has changed. Wheat is mostly between growth stages 8-9 (flag leaves emerging to flag leaves fully emerged). I can still find hot spots of aphids (primarily bird cherry-oat aphids) along with scattered powdery mildew and a low incidence of leaf rust. Leaf spot diseases also are scattered and only on lower leaves. Finding stripe rust this late and at this low of an incidence typically indicates that stripe rust will not be much of a problem this year in Oklahoma especially when coupled with limited reports of this rust in Texas. However, leaf rust still has plenty of time to develop, especially if temperature and free moisture on leaves continues to be favorable. Figure 1. Low incidence of stripe rust on winter wheat in Jackson County (southwestern Oklahoma) as observed by Gary Strickland (Extn Educator; Jackson County in SW OK) and Mike Schulz (Altus Station Superintendent). We need to give the wheat a week to see how it recovers or not. If you need me to help you look to see what we have or have not, just give me a call, 580-541-8057. The main thing is not to get in a big hurry. The soil temperature at 4 inches is around 55 degrees. Need to be getting your feed and milo ground ready to plant, with the rain, the bean planting will be easier to get started. I'm looking at alfalfa for bugs and so far have not found any. The cold weather has killed the alfalfa weevil, so we will be looking for new hatch. We also need to start thinking about pasture spraying, with the rain we should get weeds growing. Alot of the wheat is in the ground and coming up good. 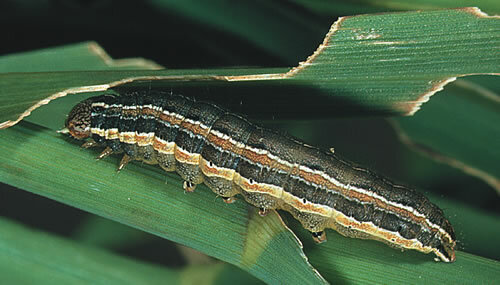 We need to keep a look out for armyworms. If you see a small spot going away, you should look hard at what's going on. We have sprayed some in the Aline area. Just give a call and I can take a look. We will start looking at the clearfield wheat for spraying at the end of October or first of November. Almost August, it's not to late for soil samples. The ones i have pulled are coming back about like they should, 65 to 85 pounds needed on the nitrogen, 20 to 80 pounds on the phosphorus. This is for a 50 bu. wheat crop. You need to be checking your seed wheat germination to make sure you don't have any surprises. Please check with us about fertilizer prices, we are ready to go for you. We can still get lime on a week or two basis. Thank you for all your grain you brought us. Call me at 580-541-8057 if needing anything. The green is gone out of the wheat and the elevators are ready to take your wheat and canola. Most of the alfalfa is cut and in bales, lot of tons, not as good quality, as we would have liked. a lot of milo and soybeans are planted and coming up. You need to be planting your sorghum sudan for the cows. Let me know about soil sample needs, i will be starting them right after harvesting. We are still spraying pasture and burn downs, let me know what your needs are.